My big pond on 7/3/99, facing west, taken from inside. They are listed from my first pond to my most recently built pond. Quick information on my big pond can be found at an old archived site which is part of a list of people's pond setups. Go here. 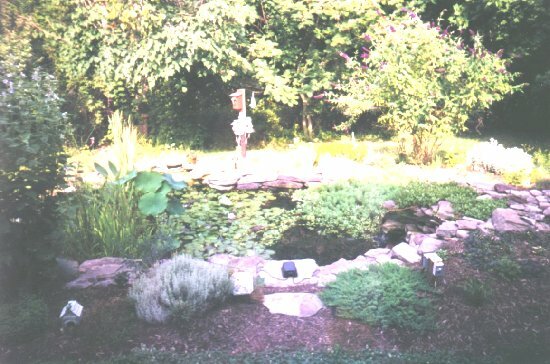 Robyn's Pond is featured on Page 119 (with information mistakenly on Page 118; and I have fathead minnows, not fathean minnows) of the 2000-2001 Ponds USA and Watergardens Annual by Fancy Publications. 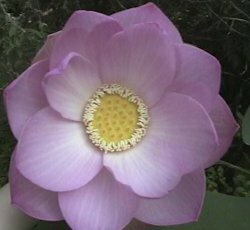 It is also in the Koi World and Watergardens 2000-2001 Annual with the photos on Page 104 and the information mistakenly on Page 100.